Denmark became the newest European country on Thursday, banning the Islamic full-face veil in public space and labeled human rights activists as "violation of women's rights". 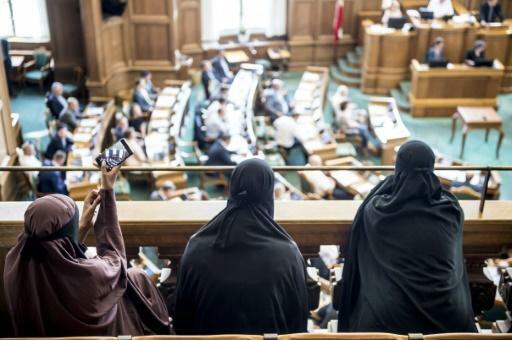 "Anyone who wears a piece of clothing that hides the public face will be punished with a fine," reads the bill passed in the Danish parliament with 75 to 30 votes. The new rule will come into force on 1 August. Wearing a burka covering the entire face of a person or the niqab, which only shows the eyes, carries a fine of 1,000 kroner in public ($ 156, 134 euros). The ban also targets other accessories that hide the face, such as balaclavas and false beards. Repeated violations will be punished up to 10,000 crowns. It is not known how many women wear the niqab and burka in Denmark. "I do not think there are many burka here in Denmark, but if you should be punished with a fine," Justice Minister Soren Pape Poulsen was quoted by the Ritzau news agency in February. But Amnesty International condemned the law as a "discriminatory violation of women's rights," especially against Muslims Women who decided to wear the full-face veil. "While some specific restrictions on wearing full-face veils for public security purposes may be legitimate, this general prohibition is neither necessary nor proportionate and violates the right to freedom of expression and religion," said the organization's Europe director, Gauri van Gulik, in a statement t after the vote.
] The full-face veil is a hot topic across Europe. Last year, the European Court of Human Rights confirmed a Belgian ban on wearing it in public. France became the first European country to enter the niqab in 2011 Banished in public places. Last year, the Austrian law on the ban on full-face Muslim garments entered into force in public places.